IRVINE, Calif., March 19, 2019 /PRNewswire/ -- MiDOG, LLC announced the launch of its new All-in-One Microbial Test. Eliciting the power of Next-Generation DNA Sequencing (NGS), the test identifies all aerobic and anaerobic bacteria, fungi, as well as antibiotic resistances. The results are presented in a comprehensive report, available within two to five business days after the sample is received at the MiDOG® laboratory. 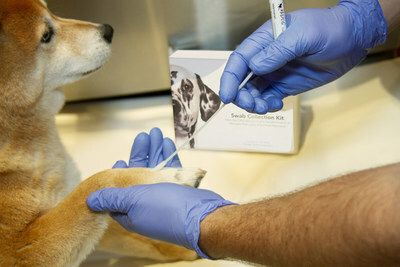 A sample is collected by swabbing a subject's skin, ear, feces, or other site, at the veterinarian's location, and sent to the MiDOG® service laboratory for processing using the supplied, pre-paid FedEx® envelope. The microbial DNA is extracted, the genomic analysis run using NGS technology, the data analyzed and filtered using proprietary software, and a comprehensive report generated for the veterinarian. Even complex samples, including biofilms, are compatible with the test. MiDOG, LLC is a privately held company based in Irvine, California. Since its inception in 2018, its main focus has been to pinpoint the microbial makeup of disease-causing microbes. Using NGS, MiDOG® procures a snapshot of all microorganisms in the sample. They have worked with a number of practitioners and veterinarians who provided clinically healthy canine samples that allowed MiDOG® to develop a comprehensive comparative database to determine the microbial makeup of collected samples. MiDOG's mission is to expand this database to other species. Their goal is to bring complete and accurate microbial identification of canine infections to help veterinarians make better treatment decisions. MiDOG® is using the only standardized and controlled pipeline for accurate microbiomic measurements and assessments in dogs that leads to absolute quantitation of the microbiome at the site and time of collection. Follow MiDOG, LLC on Facebook, LinkedIn, Twitter, and Instagram.